Owner Terry Kern credits the award to his compassionate, driven team. Caring Transitions, America’s largest resource for managing senior relocations as well as downsizing and estate liquidations, is pleased to announce that Caring Transitions of Northern Virginia has been awarded one of the company’s national Top 10 Awards. 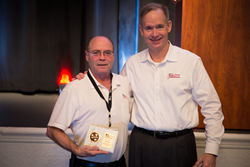 The franchise is locally owned and operated Terry Kern and the award was presented at the company’s national conference on February 9, 2018. Caring Transitions Chief Operating Officer Al Scobell said Kern’s commitment to the Caring Transitions mission, his team and his community have helped him find success. Caring Transitions is a national franchise in more than 200 markets. Caring Transitions of Northern Virginia’s specially-trained team can handle organizing, packing, de-cluttering, moving, resettling, in-person and online estate sales, liquidations and preparing homes for market. Caring Transitions specializes in managing senior relocations, but the services are also perfect for busy families and individuals in need of assistance. Caring Transitions of Northern Virginia serves the National Capitol Region and Northern Virginia Counties of Fairfax, Arlington, Alexandria, Loudoun, Fauquier and Prince William. “It’s always a pleasure to be recognized in front of our peers, especially when our peers are such a fantastic group of Caring Transitions franchisees. Even though we knew we would be in the Top 10 in sales for 2017 before we went to conference, earning this award has been a huge boost for our team and we’re energized about 2018,” Kern said. Caring Transitions of Northern Virginia is bonded and insured and all W2 employees have been background-checked. For additional information about Caring Transitions of Northern Virginia, call (571)441-0996, email TKern(at)CaringTransitions.com or visit http://www.CaringTransitionsNOVA.com.